From Soller with love. Our goal has always been to create more than just a place to sleep. We have transformed one of Sóller’s modernists buildings into an inspiring and comfortable, high-quality, low-cost retreat for hikers, Tramuntana explorers and all like-minded travelers. In the morning you may enjoy some coffee, fresh orange juice and other local delicacies for breakfast. Of course, everything from the region, because we love our island and its products! 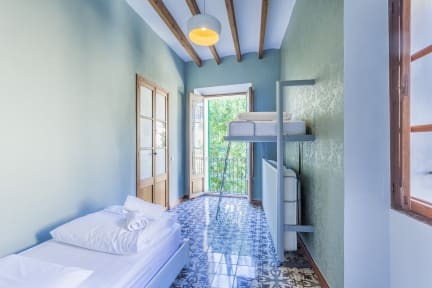 Hostel Soller - Alberg Juvenil is located in the historic center of Sóller, just within 3 min walking distance from the main square and the train station. Fuerthermore, we are near to some of the finest attractions and landmarks of the town such as Can Prunera, Ferrocarril de Sóller, Sala Picasso y Sala Miro and Museu Soller, amongst other interesting spots of the area. Likewise, Palma de Mallorca, the biggest city of the island is around 40 minutes from our facilities by car. 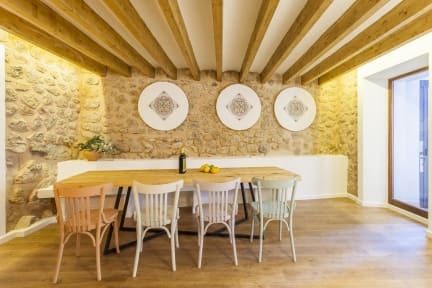 Hostel Soller - Alberg Juvenil offers you a wide range of room types, from private to shared, in case you come alone, as a couple, with family or friends. Our rooms are fully equipped with air-conditioning, heating system, Pikolin memory foam mattresses and include a set of towels and linen. The Deluxe Double Room comes with en-suite bathroom. All other rooms enjoy individual modern WC’s and showers in the annex building. A fully equipped communal kitchen and a cozy fireplace invites you to relax. The reception service is open from 08.00 to 12.00 and from 15.00 to 20.00 (low season, Oct - Mar). A great hostel with great value for money. Everything was very cozy and clean. The staff is absolutely lovely and the backyard is a peaceful corner to relax after a long hiking day. This hostel is so well designed that the details here really set a quality and comfort. The best hostel I have ever stayed in! Great hostel! Bed is very comfortable, plenty of storage space, helpful & friendly staff. The breakfast is good too, and the space is lovely, especially the outdoor seating area. Bathrooms are impeccably clean. Would stay again in a heartbeat! It was a top-notch hostel, very clean, well-equipped, very friendly and caring staff. Beautiful interior and a friendly atmosphere. In the evening it was lovely how all the hikers were sitting around the dining table, chatting the evening away. Great little family hostel. Free upgrade to a private room because there weren't many guests. Has a great kitchen and place to hang out. Awesome area to hike in. One of the best hostels I’ve ever stayed at. The staff are so friendly and accommodating, and the hostel itself is very clean and it was hard to leave. The beds are so comfy! Would highly recommend. Fantastic place. Friendly staff. Good bicycle storage. Only drawback is no AC if it’s hot. For young people traveling, this hostel was a great deal. While we did not spend much time in the hostel aside from the night, the staff was friendly and willing to help in any way possible, and the space was clean and well-kept. The only drawback is that there is not a person at the desk 24/7, and while there is a phone number that can be called, no one answered, so we had to wait for a little while before checking out. Overall, however, we would recommend this hostel to other visitors. Very nice place, with beautiful and modern decoration, and with helpful services and people. Be careful with the code door it could not work but there is always someone helping and answering on the phone.